1.) I love Carson's giggle! 2.) I love Hayden's naked hiney when he goes pee-pee! 3.) I love Carson's chubby thighs! 4.) I love when Hayden "tries" to dance! 5.) I love Carson's smile! 6.) I love when Hayden sings church songs! 7.) I love walking into Carson's room in the morning and he's standing up in his crib waiting for me to get him! 8.) 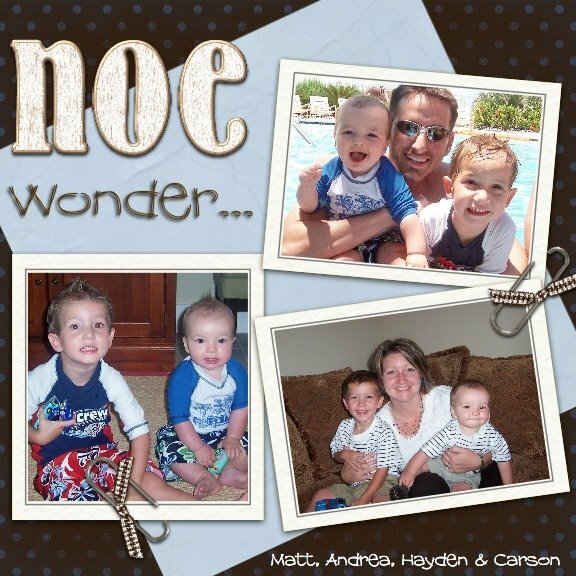 I love that Hayden calls Carson his little "brudder" and his little "stinker bug!" 9.) I love when Carson crawls to me and puts his head on my shoulder to cuddle! 10.) I love that Hayden has eaten a Nutri Grain bar every morning for 2 years and WILL NOT have it any other way! 11.) I love to watch Carson splash his bubba in the bathtub! 12.) I love that Hayden has a favorite bedtime story that you must read every night and that he has it memorized! 13.) I love that you can ask Carson where Hayden is and he'll crawl through the house looking for him! 14.) I love that Hayden is obsessed with his dad! 15.) I love that Carson is obsessed with his mom! 16.) I love that Hayden can entertain himself for hours! 17.) I love that Carson can't! 18.) I love that Hayden reminds us to pray every night so God will protect us while we sleep! 19.) I love that my two boys are so close in age and will be best friends! 20.) I love that God chose me to be Hayden and Carson's Momma!!! Coach Michael pumping them up! Hayden, I think the ball's the other way! Hayden, we don't have goalies! Noah, I saw you almost score! Yeah, Hayden...I'm good! Aiden told Hayden "that was fun wasn't it?" So cute!! My "C" and My Soccer Player!! Just sending out a "stay tuned" post for what's to come in the near future. My little Hayden is starting soccer tomorrow! They have their first muddy practice tomorrow and their first game next Saturday. He and his friends Mason, Aiden, Camille, and Noah from church are all playing in the 3-4 year old, boy/girl league at the YMCA. I don't know if Hayden will be in to it or will be the butterfly chaser but I'm sure I'm gonna get some super cute pictures of him to post on here:-) And as for my "C".....Well, it always seems like someone is pregnant or having a baby at our church. In the past year we have had lots of baby boys and their names all start with "C" (except for Brayden and Beau). So, being the creative moms that we are, we are taking all the "C" boys to the botanical gardens in Grapevine in a few weekends for pictures. We are all having shirts made that say their names on the front. Here are the "C boys"....Cohen, Carson, Caleb, Carter, Caden, Cason, Colton. This week was our first week of school. I was a little nervous about Hayden because he's been going through a weird separation thing but he actually has the same teachers this year as he had last year and most of the same friends from his old class. He was so excited and did great both days! Sadly, I think he was so tired of being in the house all summer with his crippled mom that I think he would have had fun spending the day at Walmart!! Carson goes to the nursery, just for teachers kids, and he was named "the bruiser" today! Out of about 6 "baby's," he's the second youngest and they are all boys. Pretty sad that he's the bruiser! They just said he's not afraid of anything and just go-go-go's all the time! 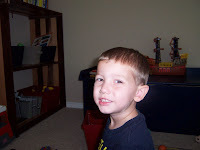 That's my Carson:-) I think this is going to be a great preschool year. Here's a few pictures from their first day.